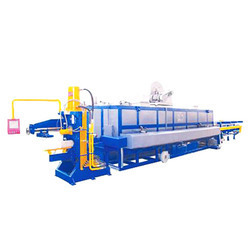 Manufacturer of a wide range of products which include hot log shear. Being a prominent firm, we are affianced in providing our clients with a distinct assortment of Hot Log Shear. Our products are full-automatic, controlled by PLC & operated by touch-screen interface. These products are manufactured in line with international quality standards by using premium quality material & contemporary techniques. Offered products are provided in various customized options to suit the variegated needs of clients.